Game of Gods is a comprehensive investigation into the changing nature of Western civilization, the replacement of the Judeo-Christian framework with a new, yet ancient paradigm. It is a journey into the cracks and crevices of big history; an expedition into the expanding realm of transformational movements and influential ideas – forces of change that are shifting how we think, behave, and relate. Juxtaposed is a different and contrasting paradigm, a reality claim that emanates from beyond time, space, and matter. We are compelled to ultimately consider two options, Oneness or Otherness. Game of Gods is structured with five independent and interlocking parts, implying a degree of thematic overlap. The book can be read end-to-end or in its individual sections, keeping in mind that each part and chapter adds to the unfolding panorama. In a sense, Part 3 offers a mid-point conclusion. Part 4, on the other hand, steps back to consider how the new paradigm manifests in four significant areas: global governance, interfaithism, transhumanism, and evolutionary culture. Each chapter in Part 4 is a self-contained mini-book, independent entries that, together, stand as a documented body of evidence; we are building the Temple of Man in the Age of Re-Enchantment. “Keep the cookies on the lower shelf,” I have heard it said, for reader’s attention spans have shortened in our age of information overload. Implied is a lower expectation, a sense that we are incapable of nuanced thought. Game of Gods, on the other hand, is written with the belief that we – author and reader – must reach for higher treasures of knowledge and understanding, that we are capable of wrestling with big ideas. With that in mind, Game of Gods is written as a robust work, treating topics with a serious tone and analytical style. Much of it is survey oriented, having a reference quality – a text you can return to in your our own studies. But it is more: Interspersed are excerpts of my own personal story, a journey of exploring and weighing worldviews, observing the interplay of global agendas, and being a witness to the tides of visionary ideas and grand movements. Game of Gods is meant to be a bulwark, an island fortress in a sea of chaotic information. From politics to transhumanism to the interfaith movement, Western culture is quickly turning away from a biblical worldview and embracing a false gospel of Oneness. Teichrib skillfully explains the roots of this shift and how the transforming gospel of Jesus Christ is still the only hope for a world enraptured with paganism.Game of Gods is exactly the resource the church needs for such a time as this. Read it! – Janet Mefferd, host of Janet Mefferd Today. Game of Gods is a must-read. 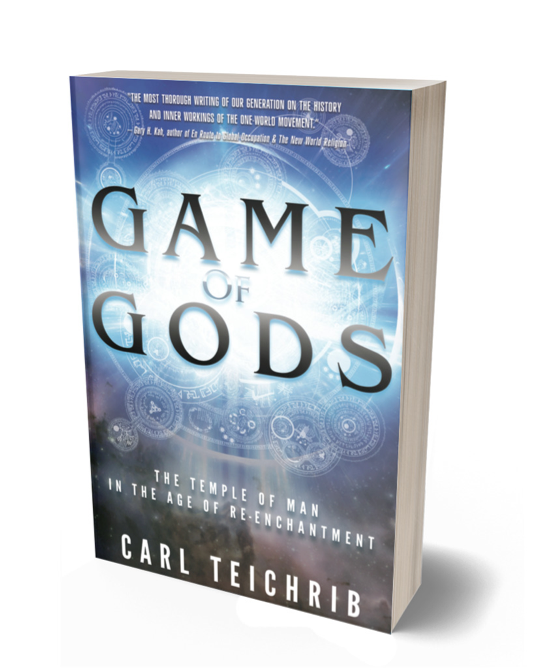 Carl Teichrib draws on primary sources and lets the leaders of a new globalist religion tell you exactly what they’re planning: a new Golden Age ruled by the gods of antiquity. – Derek Gilbert, host of SkyWatchTV and author of Last Clash of the Titans. Game of Gods is a must have for any serious Christian researcher interested in the manifestations of spirituality prevalent in our day. – Mike Spaulding, host of Soaring Eagle Radio.